Two sold out boats and a cancellation at Cebu Pier 1 meant that, despite having showed up around 10.20 on a Saturday morning, I failed to arrive to Anda (Bohol Island) in daylight and enjoy my first Filipino swim to sunset views. Too bad – but still. The delay allowed me to discover San Pedro fort, in Cebu, and the van ride from Tagbilaran to Anda was a great occasion to socialize with a group of school teachers who had attended a seminar in Tagbilaran, which they rather pompously referred to as, the city. It’s more fun in the Philippines, as they say. “Filipino girls are beautiful”, said the self-appointed MC of the team of teachers. “Are you married?”. I smiled. It wouldn’t be the last time I would hear that question asked to me by a total stranger. 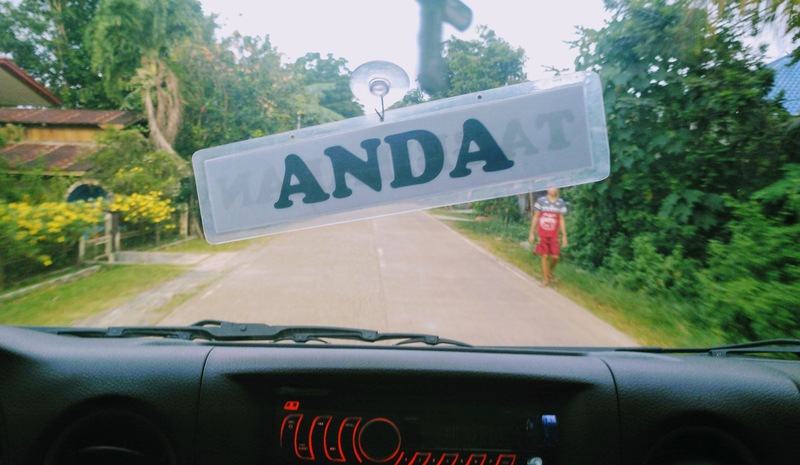 We got to to Anda at night, as expected. But I was still anxious to walk to Quinale beach, which I did as soon as I checked in at the guesthouse. I was surprised that there was live music. I found a table at what seemed as a provincial, low-key beach restaurant and ordered a large bottle of Red Horse beer. The first of many to come in my Filipino weeks. For food, I settled on pork sisig, but the waiter said they were overwhelmed, being a Saturday night, and that they had ran out of ingredients. He suggested Bam-i noodles instead. The beer came. I poured it in a glass full of ice and took my first sip. The band was playing “Santeria” by Sublime, which mixed well with the soothing sound of the breakers. I sat back and relaxed, happy to wait for my meal. I finally felt like I was on holiday. Life could hardly get any better. But it did. The bam-i were filling and delicious, Red Horse was starting to act wonders on me, and eventually I decided to stretch the evening by going for a walk on the beach, where there seemed to be a lot of action. I walked past a resort, and noticed groups of Filipinos mixing rum and coke and singing away to their karaoke setups. There was also a couple of tents pitched, with some teenage kids sitting around. They smiled at me as I walked past. On the way back, one of the groups invited me join them. They were high school kids from Candijay, also in Eastern Bohol, visiting Anda for an overnight beach party. Could I get thrown into jail for drinking with minors? I wondered as I accepted a refill of Tanduay and Coke in my plastic cup. But I was enjoying the chat. We spoke about basketball, the number of barangays in Candijay and their parents’ jobs. They were tipsy yet always polite, and definitely enjoying the exoticism of hanging out with an older European who could speak so many words in Bisaya. (The Spanish ones, admittedly). I had a photo taken with the gang, said goodbye and headed back to my guesthouse. I stopped for a pee at the public toilet adjacent to the beach bar. As I was leaving, three teenage ladyboys smiled at me playfully. I smiled back but refrained from further eye-contact. “Where you going, sir?” one of them asked. They beamed at me. Welcome back, their faces were saying.